Landscape design can bridge otherwise impassable hurdles. 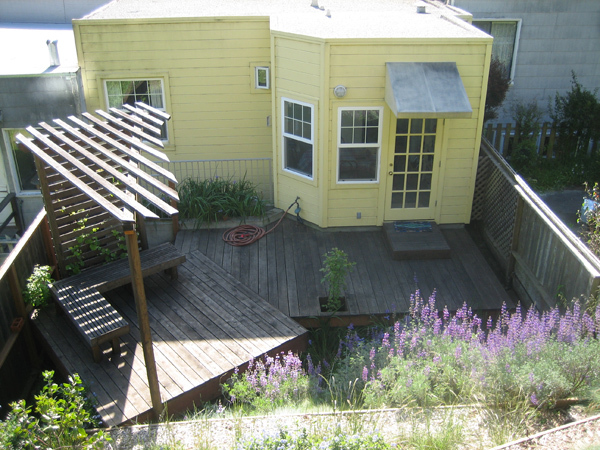 Consider the case of this San Francisco backyard: a sheer slope on the southeast face of Mount Davidson, where a concrete drainage trench carries winter's seasonal river and then runs dry for summer and fall. The trench cuts off houses from their gardens and limits human access to the yards uphill. 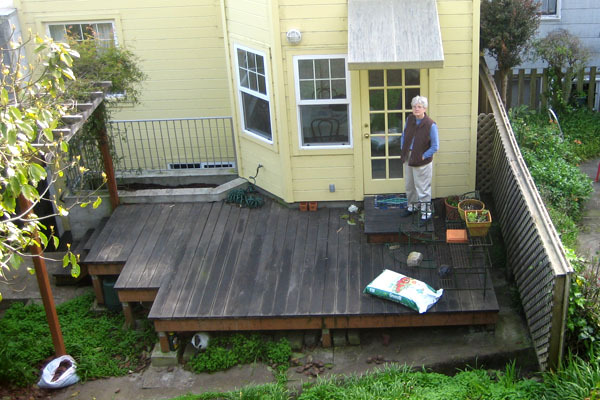 At this particular house, the existing deck was built out to the edge of the trench, with no means of getting across. Question: How to deal with this ugly yet necessary piece of engineering? Answer: Add another level of deck to bridge the gap. Set the platform at an angle to diverge from the rectangular facade of the house, and to suggest triangular shapes in the landscape. Cantilever all four edges 24" over the beams, thus hiding the posts so the deck appears to float above the ground. This deck, with bench and arbor, is both a place to inhabit and to pass through. We cut a path in switchbacks up the slope from the point of contact with the platform, removed all french broom, fennel, and ivy from the hill, and replanted with native pinegrass, junegrass, and needlegrass; a field of silver lupine and scattered Ceanothus to attract butterflies, especially the fabled Mission Blue; elderberries and manzanitas for bird-friendly flowers and berries; and more. Continue reading Deck as Bridge across Concrete Trench →.